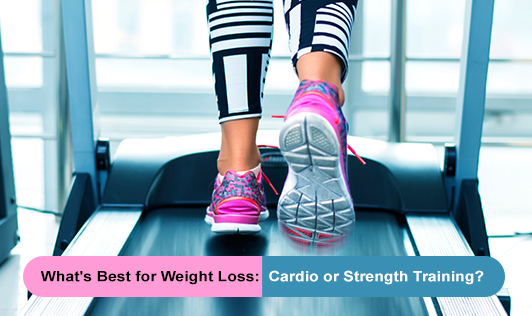 What's Best for Weight Loss: Cardio or Strength Training? The following FAQs on strength training & cardio workout, are intended to shed some light on facts and myths, and simplify what can seem to be very daunting in your fitness journey. How long should a typical strength training session last? The strength training portion of your fitness plan can last anywhere from 20 minutes to an hour. Studies show that after about 60 minutes your glycogen (stored carbs or fuel for effective exercise) is spent and you risk overtraining; it is actually counterproductive to train much past that. If you want to lose fat quickly, should you be doing as much cardio as possible? No. The amazing and often frustrating thing about the human body is it "adapts". If you start with a lot of cardio, you will lose fat. However, once your body adapts to this amount of work and fat loss slowly you will have to do more. The concern here is that you will need to eventually do so much cardio that fitting it into your lifestyle may be difficult. There are other components of a cardiorespiratory exercise program that can be manipulated other that time. For example the mode, frequency, and intensity. In order to lose weight, should you focus more on cardio or strength training workout? It depends on what you mean by "lose weight." If you are in an epic battle with your scale, cardio is the way to go. Minute per minute, cardio indisputably burns more calories than strength training.Still, cardio doesn't do much for your muscles. Strength training is the number-one way to build more muscle. One kg of muscle burns 50 extra calories a day, whereas 1kg of fat burns just three calories a day.That doesn't mean that you should retire your running shoes, though—especially if you're a stress eater. Cardio is one of the best ways to slash stress, which is a waistline-wrecker all by itself. The best solution? A fitness plan that includes both cardio and strength training. Now, clean up your nutrition act and there'll be no stopping you. You go! Should cardio & strength training be done on the same day? Best case scenario is to do cardio one day and strength train on another. If you want to do both on the same day, you may split your time between them; however, if you do we suggest doing strength training first. This will augment the fat burning process during your cardio and allows your best glycogen to be utilized for the strength training. If you are doing more than 30 minutes of cardio on the same day as strength training, we would suggest you put a few hours between them if possible in order for your system to recuperate a bit. For example, you could do cardio first thing in the morning and strength train later in the day. Doing cardio first thing in the morning on an empty stomach is the best way to lose fat. It is a way, but not necessarily the best way. When you awaken, your body is in a fasting metabolic state and burning fewer calories per unit of time than usual. Consuming some food will perk your metabolic rate up (hence, the term “breakfast” – breaking the fast). Additionally, glycogen stores are depleted by as much as 80%. This will affect your ability to work out at a high intensity and may cause weakness and dizziness and lead to early fatigue. It’s not that running as an exercise is bad, but it puts a fair amount of stress on your muscles and joints. Recreational runners can have injuries caused by weakness in the core and hip-stabilizing muscles. The better plan is to take time to develop the muscles of your core and hips first instead of jumping off the couch and running three miles. What should you be drinking after doing HIIT/Cardio/Strength training? Drinking water throughout the day to stay hydrated is necessary to prevent injury. Generally, 8-10 glasses of water in a day are recommended to stay hydrated, but if you are working out, you will also need to replace what you sweat out. Sports drinks provide electrolytes to help you rehydrate quickly, but can also be loaded with sugar, so they are not recommended for anyone trying to lose weight. An easy way to replicate the effects of a sports drink is to add a pinch of sea salt to your water after you workout. Salt helps your body absorbs and retain water.